as you walk through London, there are plenty of random things around. 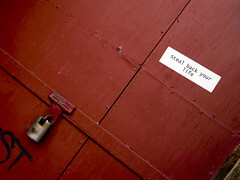 Most just get forgotten but this sticker on a locked door had me thinking and will not leave me alone. Do I need to “steal back” my life? Has it gone anywhere? Does anyone/anything hold me captive?